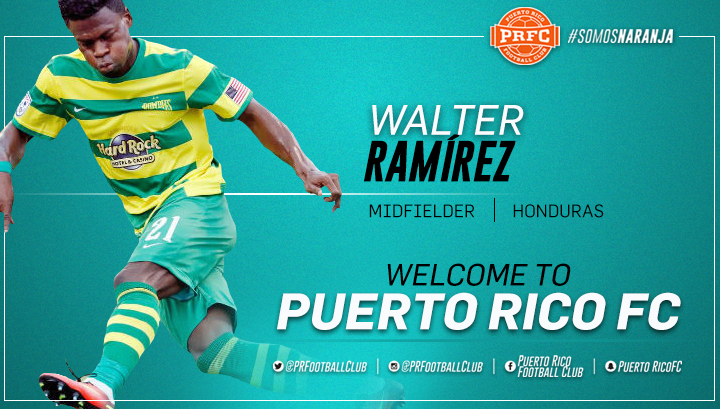 San Juan, Puerto Rico- Puerto Rico FC has signed Honduran Walter Ramírez. The 2017 NASL season will be Ramírez’ 12th as a professional and 11th in North American football. “Walter is a well-established NASL player that I have known for a couple of years. He is a threat going forward and a very athletic one. He is a fine addition to the attack options we have at our disposal and strengthens the competition for a starting role.” Said Head Coach Adrian Whitbread. Ramírez impressed PRFC’s coaching staff when they saw the Rowdies play at Al Lang Stadium in the US Cup match against FC Cincinnati. The attacking midfielder/ winger has appeared in over 200 matches with Miami FC (USL), San Antonio Scorpions, Fort Lauderdale Strikers, Indy Elven, and the afore mentioned Rowdies. Walter’s pace has been his biggest asset over the years and that, along with his ability to score goals and provide service gives PRFC another attacking option. PRFC kicks off the 2017 NASL season Saturday, March 25th at Juan Ramón Loubriel Stadium. Get your season tickets now starting at as low as $128 and enjoy access to exclusive events with players, discounts at the team store and much more. Call 787-722-PRFC to learn more about these amazing benefits or visit puertoricofc.com/tickets. Taxes and fees apply.